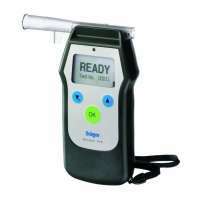 The Drager Alcotest 6810 is a professional alcohol breath analyser that its compact, user friendly and easy to use. Highly configurable and adaptable for a wide range of situations, the navigation is done with two menu keys, all other control is actioned by a single up/down key. The mouthpieces are designed for easily fitting and refitting and single-handed use either by left or right hand, quick and easy to deploy, and ergonomic in design. The gas dynamics sensor and fast pneumatic components ensure highly accurate results. This unit is capable of delivering over 1500 alcohol breath tests using just two AA sized mignon rechargable batteries (NIMH). The mouthpieces are individually packaged and designed to be hygienically and easily attached and replaced. The backlit display is optimised to deliver easily readable text messages along with multiple LEDs and audible signals. A dedicated optical interface allows the transfer and storage of measurement data and results to a printer or PC. The Draeger Alcotest 6810 features automatic sampling and calibration processing which, combined with the ergonomic design makes this a highly effective and convenient unit for using in difficult situations like at the side of the road to test for the presence of alcohol in a subject's breath when operating vehicles or machinery.